Reagan Douglas the Director & Certified Builder of Shared Living Solutions has built an outstanding Show Home situated in Rosendale Subdivision. Tauranga Painters Authentic Finishing’s Ltd was contacted by Reagan to showcase his Joinery & carpentry skills serving his trade at Joinery & Staircases under the unerring eyes of Brian Stamp, John Fox & Stan Butler. Reagan has followed up his carpentry skills into the building trade starting his own building company 20 years ago. This beautiful show home has the added features of colonial architrave which is challenging for painters & decorators as this sets the true craftsman apart from the rest. 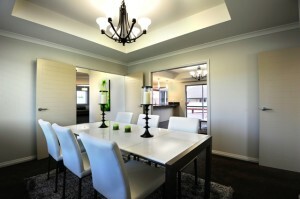 The home is painted in beautiful soft tones which reflect the colonial architecture & mixture of modern boxed ceilings. Reagan often comments on how the public always praise the quality of the internal painting and workmanship which reflects the high standard of building Shared Living Solutions produces. There are many Shared Living Solutions plans to choose from all with the same concept to create a hybrid home that has the ability to generate income, provides a separate self contained wing for special family loved ones, allows co-ownership and has a Property Sharing Agreement. All plans are built with sound proofed interior walls, key locked solid core bedroom doors, and your own kitchenette. Authentic Finishing’s Ltd introduce the aspects & benefits of using low VOC premium paints into to this homes making them more inviting for his clients who use the benefits of his separate self contained wings for elderly loved ones. This was a perfect match for Reagan’s concepts to his homes. All the Walls & three Bathroom ceilings where finished coated in Dulux Kitchen & Bathroom that holds the 7 year warranty for anti mould & has an extremely durable surface for cleaning aged marks and stains for years to come. Reagan’s show home can be found at 1 Aleisha Place, Rowesdale Subdivision, Ohauiti, Tauranga. Please check out the Photo Galley section for related photos of this show home.